Our guides meet you at airport. Minibus transfer to Råne River valley, Check in at nice 4 bed cottages. Dinner and overnight in 4 – bed rooms at the nice and comfortable Sörby Turism. Briefing over the tour with guides after dinner. Possibilities to Sauna for the one who wants. Transfer to Rörbäck Harbour. First we make a security and paddle instruction before we paddle out from the Rörbäck Harbour . Stop and lunch at Lappö Island and a short hike in the primal forest. We paddle on to the Island where we make lunch. Back to Rörbäck Harbour in the afternoon. Transfe r back to cottage camp. Two course dinner, possibilities to Sauna. Overnight in cabins. 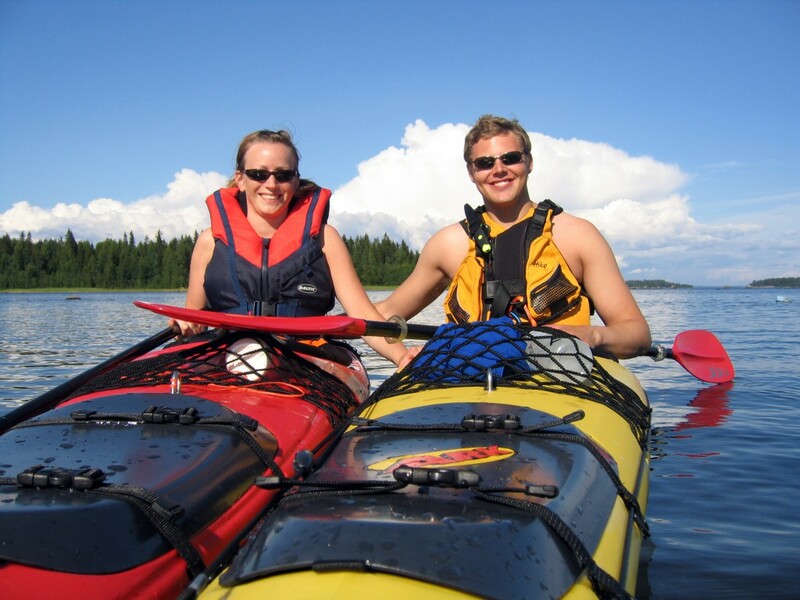 The best of paddle adventures on Kalix River. 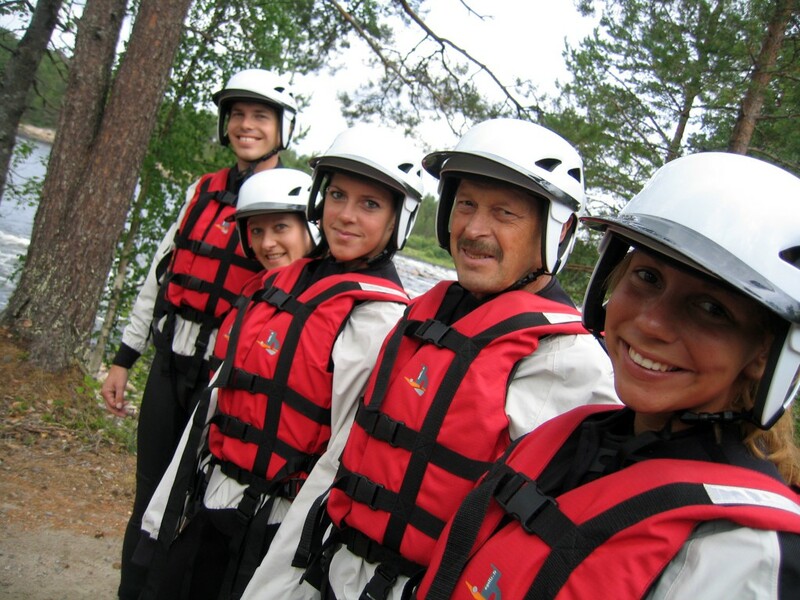 Rafting class III-IV. Transfer from Cottage camp to Kamlunge Rapids. We equip you with life vest, wet suit, helmet and wet shoes. 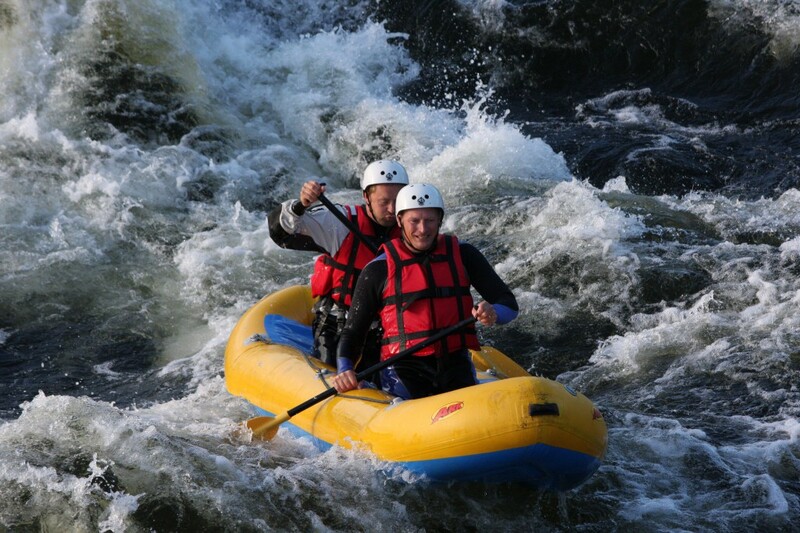 After security and paddle instruction we make a 3,5 hour along nice and dramatic rapid Kamlunge rapids. Stop by the riverbank for Lunch. Depending on water level in the river we use different rafts from inflatable canoes to 9man rafts. In afternoon transfer back to cottage camp. Two course dinner, possibilities to Sauna. Overnight in cabins. 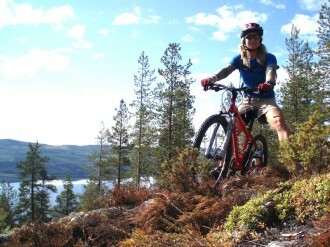 Nice and thrilling mountain biking in the surroundings of Råne river valley. We go for a mix of roads , trails and single tracks with some up and downhill. Good chances to see Wildlife. Stop for lunch at some beautiful spot. Back to camp in late afternoon. Two course dinner, possibilities to Sauna. Overnight in cabins. Try on mountain climbing with top rope and repel at the Dödlarsberget cliff. Transfer from Överstbyn to Dödlarsberget close to Storforsen nature reserve. Short visit at Storforsen lunch on the top with a spectacular view over the river valley. Climbing in class 3 -8 on bolted trails. In late afternoon back toback to cottage camp. Two course dinner, possibilities to Sauna. Overnight in cabins. Breakfast free day for own activities. Transfer to Luleå City centre. Free day for shopping or other activities in Luleå. Transfer to airport in afternoon.